Solusius is a law firm specialised in providing legal advice to treasury departments and CFOs. Solusius has broad experience with reviewing, drafting and negotiating all financial contracts a treasury department is regularly involved in, such as LMA loan documentation, bilateral loans, intercompany loans, bonds, ISDA agreements, cash management, in-house bank and payment factory contracts, supplier finance, guarantees, etc. Solusius has been engaged by several of the largest multinationals in The Netherlands to support their treasury departments. Specific to Solusius is its pragmatic approach, its broad experience with many types of finance agreements, its extensive in-house experience, and competitive fees. Compliance with sanction laws is an important topic in loan documentation. In view of increased sanction legislation, intensified enforcement and huge potential fines, lenders insist more and more on stringent clauses to ensure compliance with sanction laws by borrowers. While some years ago sanctions were no topic at all, lenders currently include sanction related representations, general covenants and information covenants in loan agreements. Many lenders fear reputational risk if a client violates sanctions and lenders tend to draft sanctions clauses that are more restrictive and broader than the sanction laws applicable to the borrower or even to the lender itself. Such broad sanction clauses may hamper the borrower in its ordinary course of business and increase the risk of an event of default under the loan agreement considerably. A description of sanction laws and the specific impact thereof for corporates are outside the scope of this article; here only sanction wording in loan agreements will be addressed a borrower may be confronted with. Unfortunately, negotiating sanction wording tends to be difficult. Lenders often argue that the proposed wording is standard wording for the bank(s) and that deviations cannot be made. Although this argument is used, negotiation is always possible. It is important to bear in mind that there is no market consensus about sanction requirements; each bank has its own sanction policy and its own preferred wording in loan agreements. The standard sanction wording of the bank acting as documentation agent is often used as a starting point when drafting sanction wording. Other lenders in the syndicated or clubbed transaction may subsequently add additional requirements to comply with their internal procedures. Sanction clauses therefore may include duplicate requirements and could be rather restrictive for the borrower. However, if the suggested wording is jeopardising business opportunities or is too burdensome for the borrower, even companies with limited negotiating power can negotiate the sanction clauses to become more workable. The Loan Market Organisation (‘LMA’) has not published recommended sanction provisions in any of its forms of facility agreement. In 2014 the LMA recommended in its Guidance Note to consider to include a representation that the borrower is not a target of sanctions and an undertaking to provide lenders with comfort that the proceeds of the loan will not be used in any way which would violate any applicable sanctions regime. The LMA states that the precise wording of any such representation and undertaking will depend on the transaction, the parties involved and the sanctions regime(s) that the parties wish to address. Unfortunately, these days many lenders incorporate much broader sanction related clauses in all loan agreements, independent of the situation of the borrower. Although there is no market consensus about sanction wording in loan agreements, there are many similarities between the sanction wording required by lenders. Sanction wording is generally included in the following (LMA) sections of the loan agreement: definitions, representations, general covenants, information covenants and event of default. When negotiating sanction wording the following elements may need to be negotiated: applicable sanctions, scope of compliance, sanctioned person, sanction investigation, use of loans, use of bank accounts, compliance procedures, materiality and consequence of breach of sanction obligations. In the paragraphs below each of these topics will be addressed. The lenders will include an obligation for the borrower to comply with sanctions. Such obligation will be included as a general covenant. Furthermore, the borrower will generally be requested to provide a representation confirming it has complied with sanctions. Such representation is often a ‘repeating representation’, which means that such representation is deemed to be repeated on various specified dates (e.g. the date a new loan is provided, the first date of each interest period, etc.). The sanctions referred to in the general covenant and representation clauses will be defined in the definition section of the loan agreement. The definition of sanctions generally encompass economic and financial sanction laws or trade embargos imposed or administered by a sanction authority. It has become common practice to include the following sanction authorities: the United States, the European Union, the United Nations and the United Kingdom and the respective governmental institutions and agencies of any of them. Sometimes the scope of sanctions is broadened by adding the country of incorporation of the borrower, an obligor or a lender, the member states of the European Union, countries where a member of the group receives payments, or countries to which a member of the group is otherwise bound. Although it seems reasonable to include the country of incorporation of a borrower, obligor or the country of a lender, it is questionable why a borrower should comply with laws of member states of the European Union it is not established in, or where a member of the group (which could be a company which is no obligor) receives payments. The reference to “countries to which a member of the group is otherwise bound” is rather vague and should be deleted or specified. The sanctions definition includes sanction laws of many countries. This means that the obligation to comply with sanction laws may enlarge the number of sanction laws the borrower has to comply with. Even if a borrower is not active in a certain country referred to in the sanctions definition, the sanction clause may obligate the borrower to comply with sanction laws of such country. To limit the sanctions that the borrower has to comply with to countries that are relevant for the borrower, it is important that representations and covenants relating to sanctions refer to compliance with ‘applicable sanctions’. The obligation to comply with (applicable) sanctions is generally not limited to the borrower. Lenders may include that obligors, subsidiaries, members of the group, directors, officers or even employees, affiliates, agents or persons acting on behalf of an obligor have to comply as well. Such wording clearly enlarges the scope of compliance. Non-compliance by the borrower, obligors, subsidiaries and directors or officers could indeed have an impact on the reputation of the borrower and impact the lenders. It is rather questionable whether this is also the case when a minority shareholding, an agent, another person acting on behalf of the borrower or an employee violates any sanctions. At least a knowledge qualifier is appropriate for these categories. Including non-compliance by employees in the scope of sanction representations and obligations seems unreasonable. A company can not monitor such compliance and, if the sanction restrictions are not properly drafted, it may limit private dealings of employees with sanctioned countries. For instance, a company entering only into transactions with local companies may accept a covenant not to enter into any business with a sanctioned country. If such restriction would apply to employees as well, the borrower should ensure that no employee uses state owned airlines, hotels etc. of a sanctioned country! Furthermore, it seems unrealistic that non-compliance with sanction laws by an employee of the borrower would impact the reputation of a lender to such company. Lenders will request a representation that the borrower is not subject to sanctions and that the borrower is not controlled by such person. There is no common definition of a person subject to sanctions. Such person could e.g. be defined as “Designated Person”, “Excluded Person”, “Prohibited Person”, “Restricted Party” or “Sanctioned Person”. Although the defined term varies, the content is more or less standard and includes three categories. The first category is a person that is located/organised under the laws of a country or territory that is the subject of country- or territory-wide sanctions, or a person who is (in)directly owned/controlled by, or acting on behalf of such a person. Currently, Crimea, Cuba, Iran, Sudan, Myanmar, Syria and North Korea are subject to country- or territory-wide sanctions. The countries that are subject to country- or territory-wide sanctions will vary over time. 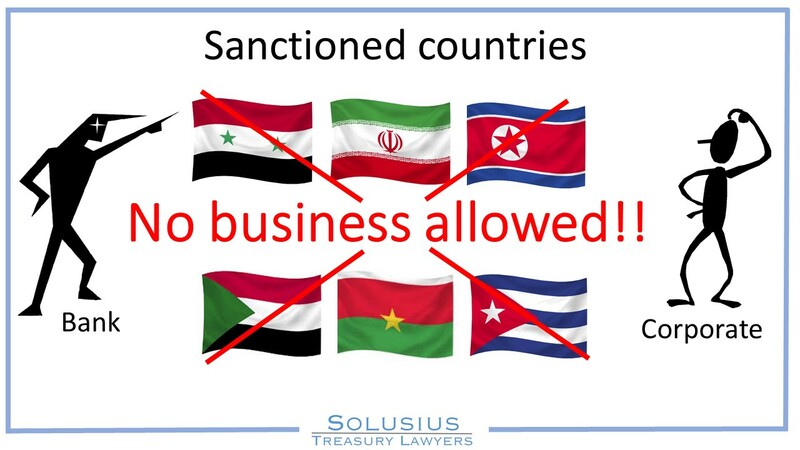 Sometimes lenders wish to include certain of these countries in the definition of persons subject to sanctions. There is no problem to do so, provided it is made clear that these countries are currently subject to country- or territory-wide sanctions. Any restriction to enter into transactions with these countries should only apply when country- or territory-wide sanctions are applicable. The second category is a person listed on or owned/controlled by any person listed on any sanctions list or any person acting on behalf of such person. In the definition section ‘Sanction List’ will be defined as a list of specifically designated persons or entities maintained by a sanction authority. Generally the “Specially Designated Nationals and Blocked Persons” list maintained by the US Office of Foreign Assets Control (‘OFAC’) and the “Consolidated List of Financial Sanctions Targets and the Investment Ban List” maintained by Her Majesty’s Treasury (‘HM Treasury’) are mentioned explicitly. The HM Treasury is the British government department responsible for developing and executing the government’s public finance policy and economic policy. The last category is a person otherwise subject to sanctions. Without further specification, the scope of this clause becomes rather unclear. It is therefore important to clarify in the loan agreement what a “person subject to sanctions” means. Another common representation requested by lenders is a confirmation by the borrower that it is not subject to any claim or investigation with respect to sanctions. Such representation can only be given with respect to investigations known to the borrower. This representation is often a repeating representation. If the full representation is a repeating representation, which means that it will be provided at various moments during the term of the loan, any investigation will lead to an event of default. This is unfair; the borrower is convicted by the lender while the outcome of the investigation is not known. The representation that there is no investigation with respect to sanctions can be provided at the date of the agreement, but should not be repeated afterwards. A separate obligation may be to inform the lenders about any claim, action, proceedings or investigation against it with respect to sanctions. Of course, the borrower can only comply with such obligation to the extent permitted by law, and wording to this effect should be included. Lenders may restrict the borrower from using the loan to fund business activities with a sanctioned person. Also lenders often include that the borrower may not repay the loan by revenues derived from any business activities with a sanctioned person. Negative covenants drafted along these lines often restrict the borrower in entering into any activity with a sanctioned person. Sanction laws generally do not prohibit all transactions with sanctioned persons. The restrictions in the loan agreement should therefore be limited to dealings with sanctioned persons that would violate applicable sanction laws. If a business transaction with a sanctioned person is allowed by sanction laws, the loan agreement should not restrict the borrower from doing so. Sometimes lenders add that loans may not be used in such (other) manner which would result in the borrower or a lender being in breach of (applicable) sanctions. Such restriction relating to the borrower is redundant as there is generally a covenant that the borrower should comply with applicable sanctions. The restriction in relation to a lender is rather strange. Apparently, this clause covers the situation that a lender becomes subject to sanctions as a result of activities of the borrower which are compliant with applicable sanction laws. In what situation will this be the case? How can such clause reduce reputational risk for the lender? In such situation the lender violates sanctions while the borrower doesn’t. The borrower should not agree to this wording as it is the responsibility of the lender that it complies with sanction laws applicable to it. Several banks do not want the borrower to credit proceeds from any activity with a sanctioned person to bank accounts held with them. In order to be on the safe side, some banks have adopted the policy that no payments to/from certain sanctioned countries may be made from/to any of its bank accounts. This may restrict the use of bank accounts considerably, as a borrower should be allowed to use its bank accounts for business activities with sanctioned persons as long as these activities do not violate applicable sanction laws. In clubbed transactions, parties often agree that the borrower will maintain all its bank accounts with the lenders. Sometimes this restriction is included besides the restriction that payments to/from sanctioned persons may not be made from/to any of bank accounts maintained with the lenders. As a consequence, the borrower cannot enter into any business activities with parties in sanctioned countries because the borrower will not be able to use any bank account to receive or make payments to such party. Without amending such restriction, negotiating other sanction restrictions becomes superfluous as the borrower cannot use any bank account for transactions with sanctioned persons. To ensure compliance with sanction provisions lenders may require the borrower to institute and maintain appropriate policies and procedures. The content of policies and procedures is generally not specified as these depend on the type of business of the borrower. For a borrower operating in its local market only, such procedures could be rather simple, while these should be detailed for multinationals. As there is flexibility in the manner to comply with this requirement, this clause is generally not negotiated. It is common to include ‘materiality’ qualifiers in representations and covenants. For instance, a representation about compliance with laws will be limited to a material breach or a breach which will have a material adverse effect on the borrower. This is to avoid immaterial and/or technical breaches triggering an event of default. Lenders may argue that stipulating that any breach of sanction provisions will be an event of default may help defend their own position against any sanctions authority in the event of a breach of sanctions by the borrower. Therefore, many lenders are reluctant to agree on materiality qualifiers and cure periods for breaches of sanctions. Nevertheless, including a materiality qualifier in the obligation to comply with sanctions is advisable to avoid that immaterial and/or technical breaches trigger an event of default. It is unrealistic that an immaterial breach will impact the position of the lenders. Another important issue to consider is what the most appropriate consequence of a breach of a sanction representation and/or undertaking should be. Generally, such breach will be an event of default. Usually lenders insist that no cure periods apply to such breaches; a breach of sanction obligations may immediately lead to termination of the loan agreement. In syndicated transactions, lenders sometimes prefer to determine for themselves whether to exit the loan agreement in the event of a sanctions breach. In such situation a mandatory prepayment right for each individual lender may be an appropriate consequence of a breach of the sanction representation and/or undertaking. Also for the borrower, a mandatory prepayment right would be preferable as this could avoid cross‑default implications. Unfortunately, an event of default is the standard consequence of a breach of sanction provisions and mandatory prepayment is a rare alternative. Sanction restrictions have become a standard element in (LMA) loan documentation. However, there is no market consensus about the content thereof. Many lenders tend to include rather broad and very restrictive sanction clauses in loan documentation. Lenders do so in order to comply with sanction laws, to limit their reputational risks and to improve their defence against regulators in case of a violation of sanctions by the borrower or persons affected with it. These clauses could limit the ordinary course of business of the borrower or put an unrealistic burden on the borrower and persons associated therewith. It is therefore important to carefully review and negotiate sanction wording, preferably already in the term-sheet phase. De Vijverhof has entered into two separate LMA Facilities Agreements to refinance existing loans. One agreement is entered into by the Hervormde stichting Bejaardenzorg Capelle ad IJssel, a residential care centre that offers different types of care to elderly people. 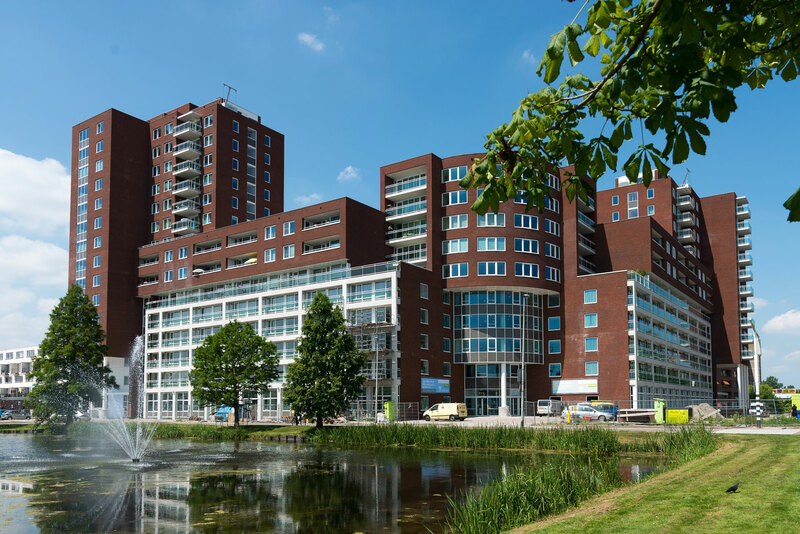 The other facility agreement is entered into by the Hervormde Stichting tot Verzorging van de Belangen van Ouderen, a foundation that rents appartments. Solusius has advised both foundations on all legal aspects of the transaction, including the LMA based Facilities Agreement, security agreements, conditions precedent and internal approvals. 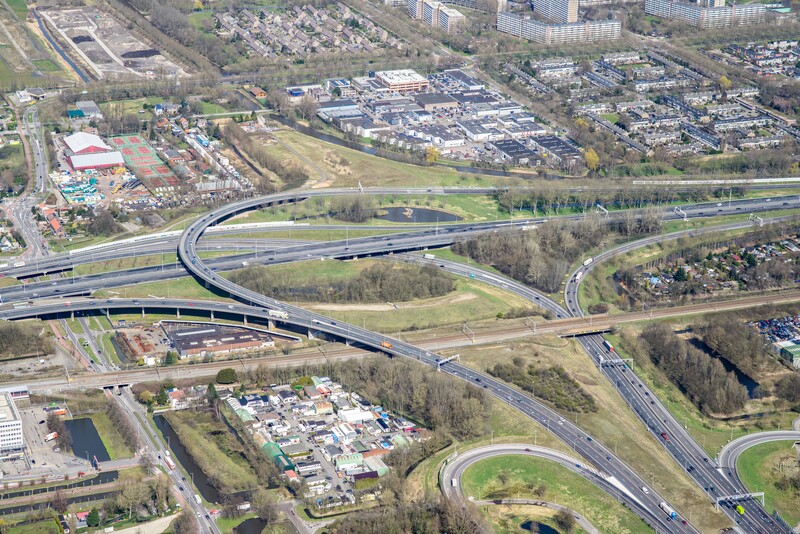 Solusius has assisted Van Oord in its role as shareholder and sponsor of the De Groene Boog consortium, which will construct a new motorway: the A16 Rotterdam. De Groene Boog is a combination of Besix, Dura Vermeer, Van Oord, John Laing, Rebel and TBI. The motorway will be located along the northeast periphery of Rotterdam and will link to the N471, Ankie Verbeek-Ohrlaan and Terbregseplein. The road will be incorporated into the landscape as effectively as possible and will be energy-neutral for 20 years. Solusius has assisted Van Oord with the review and negotiation of the finance contracts with the lenders and Van Oord’s shareholder commitments and related guarantees. The Blauwwind Consortium announced on June 28, 2018 financial close on the Borssele III/IV wind farms in the Dutch North Sea. This sets in motion the construction and subsequent operation of 77 V164 9.5 megawatt (MW) turbines produced by MHI Vestas, with a total installed capacity of 731.5MW, enough to power some 825,000 households. Total expected production is 3,000 gigawatt hours (GWh) per year. The main construction work is due to start in the fourth quarter of 2019, with commercial production expected in early 2021. The consortium partners are Partners Group (45%), Shell (20%), DGE (15%), Eneco Group (10%) and Van Oord (10%). The project capex for the construction phase is €1.3 billion, part of which will be funded through project finance. Solusius has assisted Eneco with the review and negotiation of the finance contracts with the lenders and Eneco’s shareholder commitments and related guarantees. 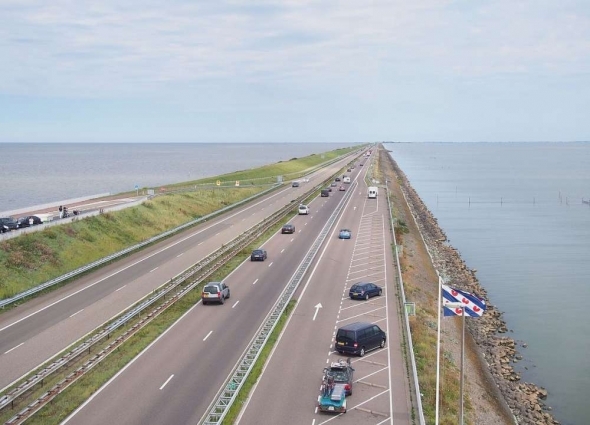 Solusius has assisted Van Oord in its role as shareholder and sponsor of Levvel, a consortium comprising Van Oord, BAM, and Rebel which will strengthen and improve the Afsluitdijk. The total project costs are estimated to be EUR 550 million. On the Wadden Sea side, the causeway will be raised and reinforced with new facing. To protect the hinterland from the force of the water, the drainage locks will also be reinforced and two storm-surge barriers will be built. Solusius has assisted Van Oord with the review and negotiation of the finance contracts with the lenders and Van Oord’s shareholder commitments and related guarantees. Solusius has advised Dutch Infrastructure Fund (DIF) in the last 6 months on all legal aspects of an EUR 200 million credit facility for DIF Infrastructure V Fund and the ISDA agreements for this Fund, an EUR 120 million credit facility for DIF Core Infrastructure Fund I and In-house Bank/payment factory documentation for several funds of DIF. 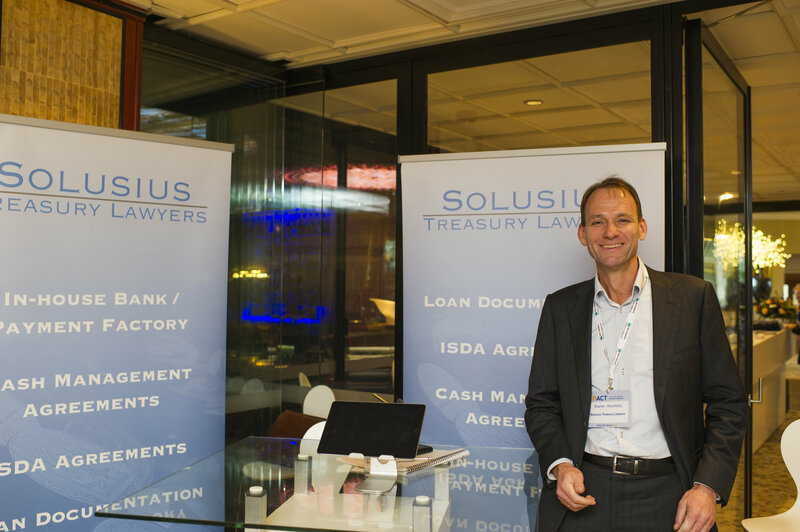 For the first time Solusius has a stand at the Treasury Fair, which is organised yearly by the Dutch Association of Corporate Treasurers in Noordwijk. Many existing and potential clients visited the stand. Agrocare has entered into an LMA Facilities Agreement to refinance existing loans subsequent to the merger with Kesgro in 2016. AgroCare is growing 11 different varieties of tomatoes in The Netherlands, Tunisia and Maroc. Solusius has advised AgroCare on all legal aspects of the transaction, including the LMA based Facilities Agreement, security agreements, conditions precedent and internal approvals. 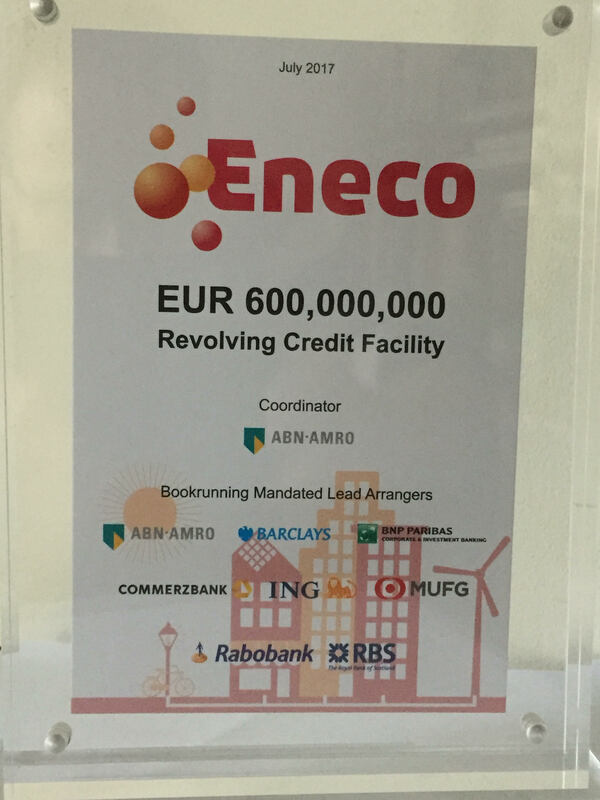 N.V. Eneco Holding has entered into an EUR 600 million Revolving Credit Facility with a syndicate of banks. Solusius assisted Eneco with the drafting of the long form termsheet, the credit facility, internal approvals and delivery of conditions precedent. 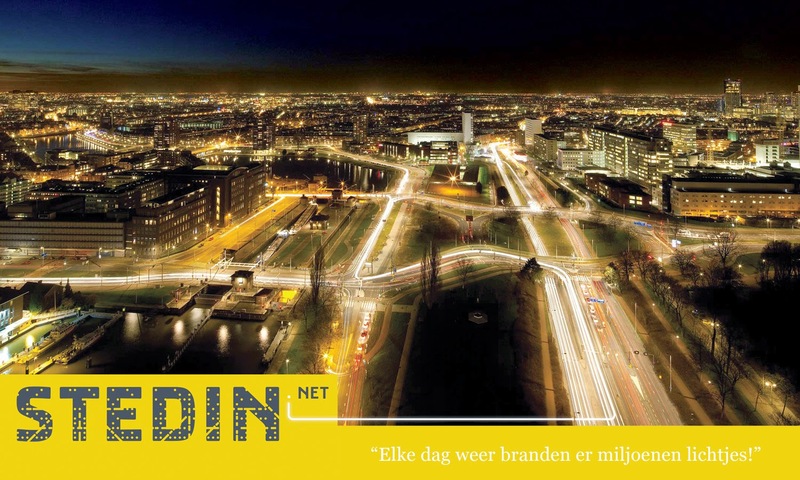 Stedin Holding N.V. has entered into an EUR 600 million Revolving Credit Facility with a syndicate of banks. Solusius assisted Stedin with the drafting of the long form termsheet, the credit facility, internal approvals and delivery of conditions precedent. Solusius has assisted Stedin with the legal aspects of an Acquisition Facility Agreement and assignment and amendment of loans with an aggreate nominal value of EUR 160 million for Stedin in connection with the acquisition by Stedin of the Delta Network group, acting under the name “Enduris”. The acquisition price is approximately EUR 450 million, excluding debt and other amendments amounting to EUR 160 million. 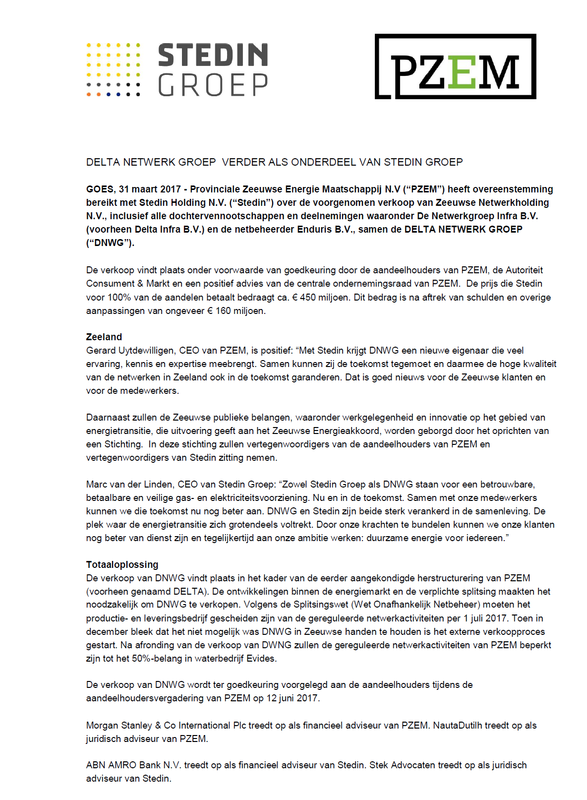 For further details, see the press release below (in Dutch). 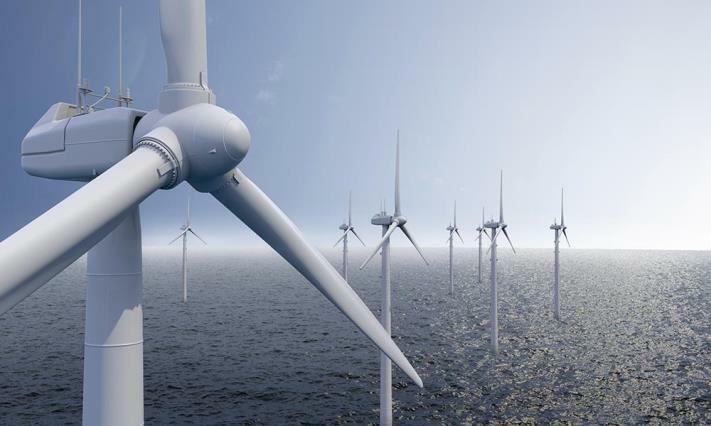 Solusius has assisted Eneco in its role as shareholder and sponsor of the Norther wind farm. Norther will be the 4th windfarmproject alongside the Belgian coast, generation of sustainable Electricity for over 400,000 households. With a capacity of 350 MW and an investment of over EUR 1,2 billion, Norther is set to become Belgium’s largest offshore project. Norther starts works in 2017 and commissioning around 2018. Solusius has assisted Eneco with the review and negotiation of the finance contracts with the lenders and Eneco’s shareholder commitments and related guarantees. Solusius has advised NSI on the amendment and Restatement of its EUR 465 million Facilities Agreement. The existing facilities have been increased and the term of the revolving credit facilities has been extended with 1.5 years. 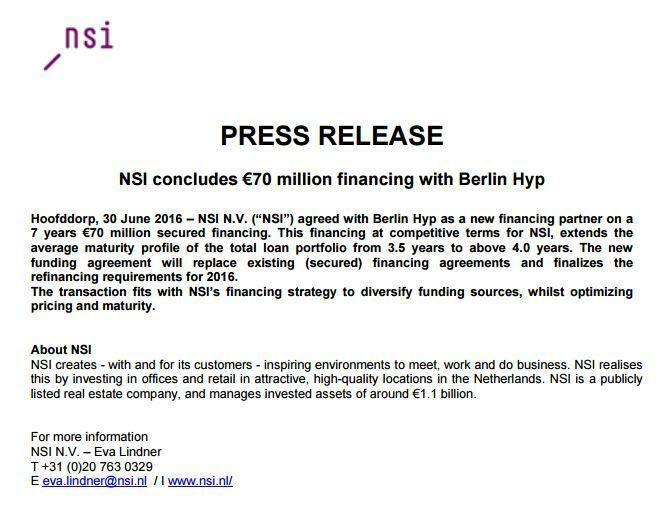 Solusius has assisted NSI with all legal aspects of this transaction. Eneco will be separated into two independent companies as of ultimo January 2017. The the energy transport activities will, jointly with the activities of Stedin, form one company, while the energy generation, trade and supply activities of Eneco will form another company. As part of this separation, Solusius assists Eneco and Stedin on all legal aspects of the set-up and amendment of the treasury agreements of both companies. Solusius assists amongst others with the set-up and amendment of the cash management agreements, ISDA Agreements, Guarantee Facilities, Bridge Facilities, transfer of Green Loans, EMTN and ECP Programmes and the split of the RCF. In total finance agreements with a value over EUR 2,000,000 have to be amended or entered into. 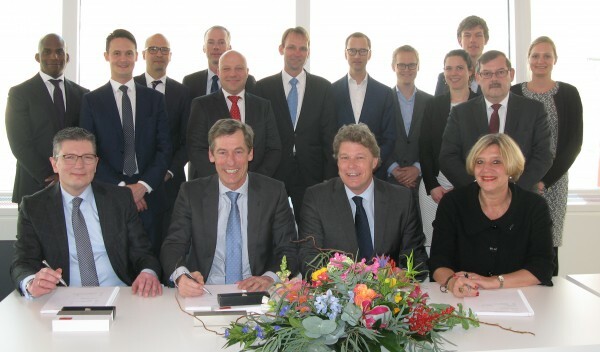 Port of Amsterdam has entered into an EUR 110 million LMA credit facility with Rabobank and Bank Nederlandse Gemeenten. Solusius assisted Port of Amsterdam with the drafting of the long form termsheet, the credit facility, ancillary facilities and the conditions precedent, including internal decision making and alignment with the Municipality of Amsterdam. This successful transaction has been elected the ‘Transaction of the Month” by Rabobank. Joris van der Kolk, legal counsel Port of Amsterdam, is very satisfied with the assistance provided by Solusius: “Maarten Steyerberg was a great support in this transaction. He is an expert on LMA documentation and contributed a lot in getting the transaction closed in time. He has a very quick response time, focussed on the main issues, helped to obtain the internal approvals in a pragmatic manner and assisted to timely satisfy the conditions precedent. Furthermore, Maarten is an enjoyable person to work with. We could not have made a better choice”. Wilko Tijsse Claase, general counsel of Port of Amsterdam adds “I have worked before with Maarten and also in this transaction he added a lot of value due to his focus on the main issues, his in depth knowledge of LMA documentation and his broad experience as legal counsel”. Solusius assists Van Oord with the negotiation of regional cash management mandates in Europe, Asia and the Middle East by negotiating the general mandate, sweeping and pooling agreements, general banking conditions, local conditions and overdraft facilities. Marlies Janssen, treasurer of Van Oord involved Solusius again after the valuable contributions Solusius made in the refinancing process of the EUR 400M RCF of Van Oord in Q1 2015. Marlies Janssen: “Maarten Steyerberg of Solusius helped to negotiate state of the art conditions for our EUR 400 million RCF and I am sure that his extensive experience with international cash management mandates and his pragmatic approach will be of great value to us in these projects as well”. Interfood has involved Solusius to support with the negotiation of various ISDA contracts. Ernes Zelen, Treasurer of Interfood: “We involved Solusius to negotiate ISDA contracts with one of our relationship banks in various jurisdictions and to advise Interfood on other finance and commercial contracts. I especially valued Maarten’s his solid legal advice, practical approach and fast response time. He has a proven record on advising on ISDA Agreements and has been of great value to Interfood in the negotiation of other ISDA Agreements”. Solusius has been engaged by Philips Lighting Holding to draft a model Schedule to the 2002 ISDA Master Agreement and to negotiate it and related documentation with more than 20 international banks. Furthermore, for entities of Philips Healthcare in countries that do not permit central execution of derivatives, ISDA agreements are negotiated with multiple relationship banks in each country. Koppert Biological has completed the refinancing and extension of its existing loan portfolio and has entered into an EUR 80 million credit facility with Rabobank and Deutsche Bank. Solusius assisted Koppert Biological on all legal aspects of the transaction, including the LMA based loan documentation, ancillary agreements, security documentation, intercreditor agreement and internal approvals in 10 jurisdictions. 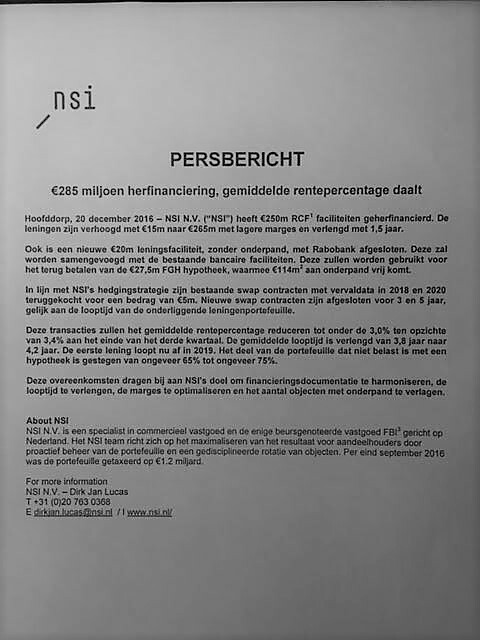 Joke Pieterse, treasurer of Koppert Biological Systems, requested Solusius to advise the company. Koppert Biological Systems was looking for an experienced and hands-on finance lawyer who would work on the transaction in close cooperation with the treasurer. Joke Pieterse: “We needed a finance lawyer who is an expert on the LMA loan documentation and could do a sanity check on the issues governed by other jurisdictions than the laws of The Netherlands. Maarten Steyerberg of Solusius has helped us in a very practical way by showing us the pro’s and cons of certain options. He facilitated a smooth legal process”. Solusius advises Royal Philips on and drafts all documentation for the in-house bank of Royal Philips. Each day hundreds of transactions between Philips entities are recorded that result from intercompany deliveries, cash sweeping, direct debiting, and payments made on behalf of other entities. The balances of these transactions are recorded on intercompany bank accounts. Solusius drafts agreements and related general conditions that allow for smoother and more streamlined in-house banking transactions and practices and that further enable a flexible means of enacting companywide or country specific amendments. Additionally, the agreements include compliance with US and European legislation on intercompany derivatives.